The packaging of the board game. 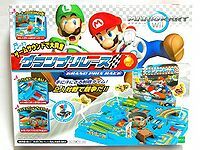 The Mario Kart Wii Grand Prix is a remake of the original racing board game Mario Kart Grand Prix. It was created and manufactured by Epoch and released in August 2010. The artwork, design, sound, and music assets are based on the Wii game Mario Kart Wii. The goal of the board game is to reach the end of the track by overcoming the obstacles in all four of the race courses integrated into a single board. It is primarily a two player game, and each player is given a colored ball that is either red, representing Mario, green, representing Luigi, orange, representing Bowser, or blue, representing Toad. New to the remake is a time-attack mode that lets a single player race on all four courses on the board in a limited amount of time, as well as the ability to play sounds and background music from Mario Circuit, Moo Moo Meadows, Grumble Volcano, and Rainbow Road. The remake is also given an overhaul in appearance to include race course themes. The whole board - body size is 40cm. The promo for the game. The zones of the board. This page was last edited on May 4, 2017, at 15:07.